Where once there was love and trust, there's now anger and fear. We loved you, Toyota. 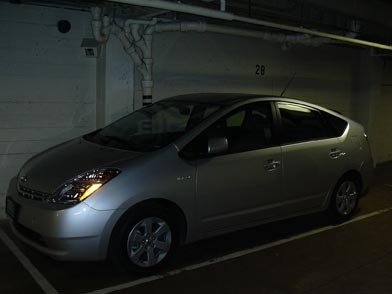 We loved buying our first car, our Prius. Our Car. We loved everything about the process. There was no price dickering, no smarmy persuasions, no attempts to upsell. We loved that car so much. We loved the mileage, the Star Trekkian lines, and we loved freaking our friends out when the electric motor took over and the car quivered into blissful silence. We called our car The Defiant. Now we wonder if we should change it to Christine. Now we wonder if the car we loved is going to turn on us. We wonder if we should sell back the car we loved in order to save our lives. Now, before going anywhere in our car, we have make sure we know how to try and stop a car that is accelerating out of control. We trusted you, Toyota. We drove our newborn son home from the hospital on your wheels. In the car you said was safe. Now we wonder if each trip in that car where we don't accelerate out of control or lose all braking capabilities is a gift. Car safety should not be a gift. Car safety should be a guarantee. Your guarantee. We trusted you, we loved you, we supported you, and you betrayed us. You said there were fixes, Toyota. You promised that you knew what the problems were and how to handle them. Clearly, you do not know. Clearly, you have no idea what is going on. You said you "stubbed [your] toe." Really, Toyota? People have died, and you say you "stubbed [your] toe"? Do you even get the enormity of this? I mean, beyond your bottom line. Beyond what it's going to do to your ability to ever turn a profit again. Do. You. Get. It?! And I'll tell you what, I'm not a violent person but every time I see one of your ads on TV -- you know, those ads where you're trying to win back public trust? -- all I want to do is put my foot through the screen. Yes, this is an entirely emotional response to the recent news. Funny thing, I tend to get that way when I worry about DYING. Dammit, Toyota, what the HELL is wrong with you?